Let me start by saying that I really wanted to make chocolate chip cookies instead of a smoothie for my post-lunch snack. I REALLY wanted to. While browsing Pintrest I found a recipe that looked amazing and different than my favorite chocolate chip cookie recipe. But then the angel on my right shoulder kicked in and told me not to. “Make yourself a healthy, filling and nutritious smoothie instead,” it whispered to me. It wasn’t tough to change my mind. I walked 4 miles today and have been on-target all week with my points and nutrition. Why blow it the NIGHT before my weigh-in? The whole point of Weight Watchers in my eyes, is to learn how to make smarter choices. You don’t have to feel deprived, but it also doesn’t mean you should give in to every craving and whim on a weekday afternoon. So I’m saving the cookies for tomorrow night. 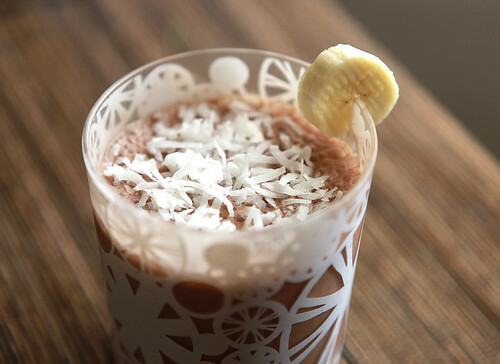 Smoothies have a supernatural ability nonetheless, to convince my taste buds that what I am drinking is a dessert. So, it’s a win-win. Here’s the recipe I made up, and I’ve included the Weight Watchers Points for those of you who might be on the plan. Most of you who know me know that I am a little coconut obsessed. 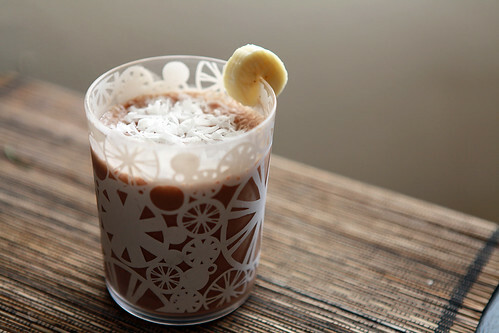 If you don’t like coconut, you can replace it with regular milk, or even almond milk if you’re feeling snazzy. 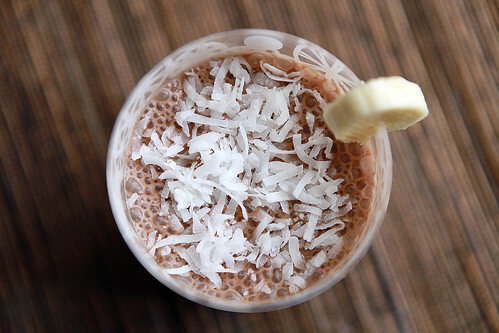 Combine everything in the blender & sprinkle with shredded coconut. Total count: 7 points. It’s extremely filling, and makes 2 large cups worth. More importantly it provides real nutrients instead of butter, sugar, flour and chocolate chips. Granted, the 2 tbsp of sugar is… not ideal, but it tasted too chalky with only 1 tbsp, and I don’t like Splenda or artificial chemical sweeteners. I’d rather have a little of the real thing and feel satiated. Hope you enjoy this. 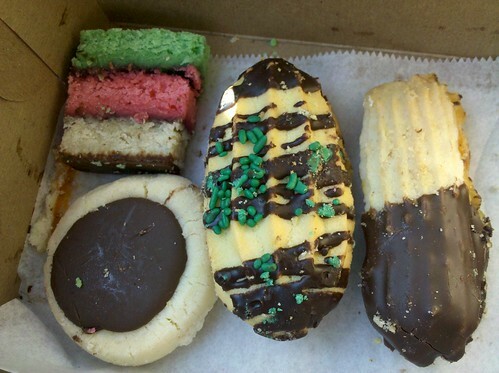 We don’t really have many options here in Orange County when it comes to good, authentic Italian bakeries and stores. Growing up in Arcadia & Monrovia, CA I was lucky enough to live close to another Claro’s and I have tons of nostalgic memories of going there with my Nana on her trips to get fresh deli meat, cheeses and of course, cookies. So, once in a while I cave in and make a pit stop for some of my favs. 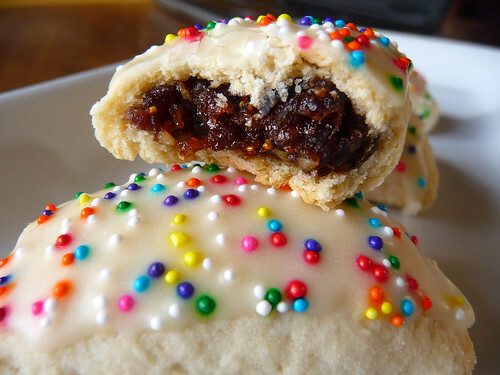 I really want to master some Italian cookie and pastry recipes (namely, the chocolate buttons, rainbow cookies, shells with cream, plain anisette cookies, Mom’s chocolate chip biscotti, fig cookies and sfogliatelle, which you can’t find in So Cal). My Nana is the person to go to for that Italian fig cookie recipe. Every year she makes them around Christmas and I hope to have her teach me this year so I can continue the tradition in my own home. 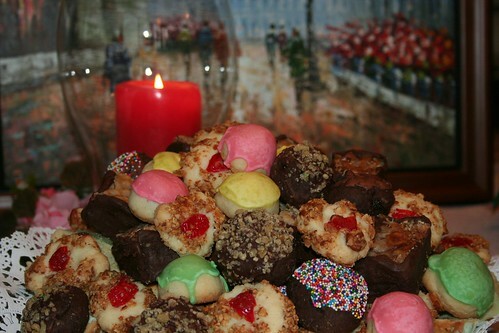 Anyhow, sweet dreams of cookies. One of the many perks of being an in-home music instructor is that I am often given food and snacks from the families I teach for (once and a while, even a whole meal). I thought it would be fun to share what some families are dishing up, especially since I work for an extremely culturally vibrant set of students. 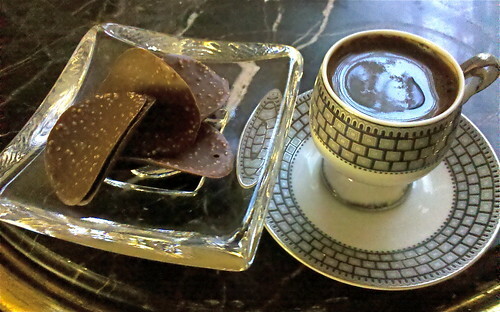 One of my student’s parents is from Syria and she often serves me the most exquisite mint tea and Turkish coffee. Once, on a particularly hot day, she gave me a huge sorbet with fresh nectarines and strawberries in it– I dream about that dessert on a regular basis now. It happened as I thought it would: a pound of See’s chocolates later and I’m convinced I definitely gained more than a pound during the past two days of debauchery. Breakfast was comprised of onion bagels, whipped cream cheese, fresh blueberry pancakes, cheesy scrambled eggs, coffee and chocolate truffles from TJ’s. 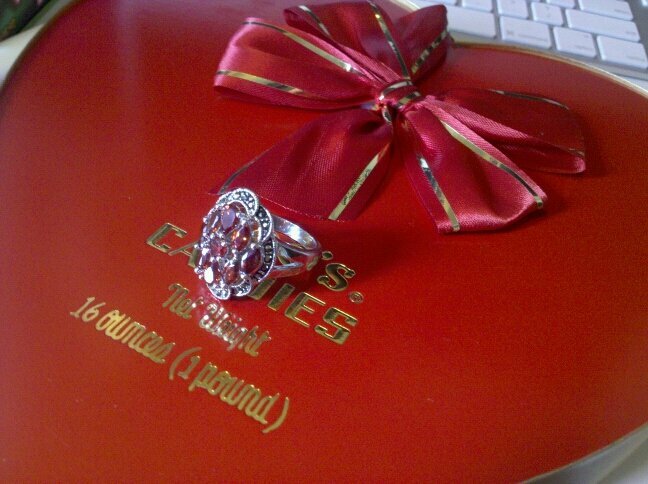 I love Valentine’s Day– the only day where you can binge on decadent chocolates served in a big, pretty heart-shaped box (although now I realize that the heart alludes more to heartburn you endure later than love). For dinner we went to El Torito, where I packed in about 8 freshly made flour tortillas (served with honey butter), 2 huge peach margaritas, a shot of tequila and fish tacos. MMM. I’m also going to sport my pedometer to make sure I hit 10,000 steps and up the water intake. I’m determined to lose 2 pounds by Friday morning damn it and I need to meet my weekly goals in order to hit my target weight by my senior recital!